Lacrosse is the fatest game on two feet! Be ready for the upcoming season. To get ready for lax running should be a part of all workouts, these drills don't require a gym, or any expensive equipment. This is a plyometrics exercise. Along with a strength training program, plyometrics will help to improve your sprinting power. 1. Jog into the start of the drill for forward momentum. 2. After a few feet, forcefully push off with the left foot and bring the leg forward. At same time drive your right arm forward. 3. Repeat with other leg and arm. 4. This exercise is an exaggerated running motion focusing on foot push-off and air time. Speed training drills like these help to develop foot speed and co-ordination. 1. Set up a series of cones in a straight line. The first 10 cones should be about 1 meter/yard apart. The next 10 should be 2 meters/yards apart. 2. From standing start sprint the total length of the cones taking one step between each marker. 3. The cones close together will encourage faster, shorter strides. You can gradually decrease the distance between cones as you progress. Walk slowly back to the start to recover. The basis of these speed training drills is a 10-20 meter/yard sprint. You should focus on accelerating as quickly as possible by powering away with your arms and legs. If your sport involves reacting quickly from different starting positions (as most sports do) try to vary the starting position. Examples include doing a press up then sprinting, sitting on your hands, lying face down, doing 5 squat jumps before sprinting etc. This drill requires you to mark out distance of about 100 yards/meters where you can sprint in a straight line. You also need to mark a halfway point either with some landmark or a mark on the ground. Starting at one end, gradually accelerate to reach full speed at the halfway point and continue to sprint to the end. Slow down gradually to a jog, turn and walk/jog back to the start. Speed training drills like these help to develop speed and power endurance. Remember though the emphasis should be on the quality of the sprint so allow plenty of time to recover as you walk between sprints. This is an excellent drill for developing lateral (sideways) agility. 1. Place 4 cones in a straight line about 3 yards/meters apart. 2. In between each pair of cones place another cone about 3 yards/meters to the left. 3. Sprint from one cone to the next touching each one with your hand. 4. Try to take quick side steps, rather than turning to face the marker and running forward. Set out a course according to the diagram below. Cones are used to mark out a series of numbers in varying sizes. For large groups, split the team into groups of two or three and have each player run around the number or figure. Each player performs the figure once before moving onto the next figure. Soccer and hockey players can dribble a ball around the cones while football and rugby players can run with the ball to make the drill more sport-specific. 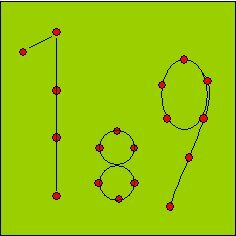 Set out as many figures as you want and vary the heights so players are required to work over varying distances. Set up a series of cones similar to the diagram below. The working player starts by sitting down cross legged. On the start command they run to their right and back, run backwards and back an then to the left and back at full speed. A server (yellow) can be added to throw a ball which the working must catch and throw back or volley back etc. Set up a series of markers similar to the diagram below. Starting at the first marker sprint to the second marker and side step to the third marker. Continue until the end. Rest and repeat in the other direction so side steps lead with opposite foot. Mark out a square approximately 10 meters/yards by 10 meters/yards. Place a cone in the center of the square. This is the starting position. Each corner is given a number or name. The coach or a training partner calls out a number or name at random and you must run to the corresponding corner and return to the center. As a variation two players can use the square at once. One player is labelled A and the other B. The coach calls out two numbers. Player A must run to the corner corresponding to the first number and player B to the second number. This drill sounds complicated but its easy to implement and its excellent for getting players to concentrate. All exercises should be done with your Lacrosse Stick and at least gloves. Run with your helmet if you can. Always strech beofre and after conditioning. Running up hills, is a great way to condition. All of these things can be done in your back yard. Use your imagination and make games out of conditioning. Set goals for yourself and keep track of progress.